Landowners residing at Kokorobite has donated an amount of GH¢3,000 to the Power Distribution Service (PDS) staff who was assaulted some weeks ago in the line of duty. The PDS staff, Gershon Asiedu was attacked and sustained cutlass wound on his nose whiles carrying out his duty together with some of his colleagues to restore power in Kokorobite during a time when power was unstable in the area. To show remorse and condemnation to the act, the leadership of the community made the cash donation to Gershon Asiedu to help cover the cost of his hospital bills. He received the money from the Nii Arde Nkpa family, landowners of Tuba, Langmaa, and Bortianor to be used to support his upkeep. 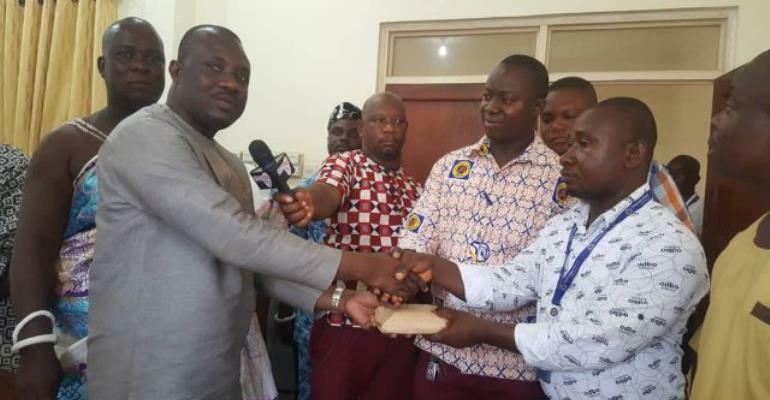 After making the donation to Gershon Asiedu, Daniel Nii Arde Tagoe, who led the Nii Arde Nkpa family, rendered an unqualified apology to PDS and its staff for the unfortunate incident. “Such an act must not be entertained at all in our society. We frown upon such behavior and so we are here to render an unqualified apology to PDS and Mr. Gershon Asiedu,” Nii Ade Tagoe said. He further extended the appreciation of the town on behalf of residents to PDS and its workers for listening to their appeals and restoring power to the entire Kokorobite community. That notwithstanding, Nii Tagoe assured PDS that such incident will not be repeated on their land again. He further pledged their support to work hand-in-hand with the Police to find the culprit who inflicted cutlass wounds on Gershon Asiedu. The Ocean View Residents Association of Kokrobite led by Simon Appadu, also made a cash donation of GH¢1,000.00 Gershon Asiedu to support his upkeep. The Bortianor PDS District Manager, Michael Abbey, commenting on the issue narrated how his men had stormed Kokrobite in an attempt to restore power to residents after detecting a fault on some of their lines when the unfortunate incident happened to them. He then appealed to the landowners to lead in the fight against illegal power connections in the area.